Black pepper or Piper nigrum is a climbing plant of the family Piperaceae. Black pepper leaves are thick, green in color and are very fragrant. The flowers grow on a cluster, they are tiny and white. This tropical vine is grown in the tropics for its berries that give a sought after spice called pepper. Seeds of black pepper are round and resemble those of kapok. Unlike black pepper which is a climbing plant, Sichuan pepper is a shrub that also gives an exceptional spice. 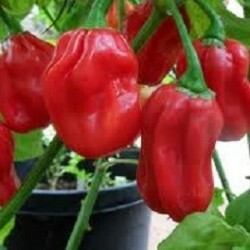 Pepper grows in clusters after fertilization of the flowers. Black pepper is picked when ripe. Black pepper seeds are yellow when ripe. They are picked and then allowed to dry in the sun. When drying, the peppercorns are wrinkled then browned to become black pepper. Black pepper is a spice that is used in seeds or roughly crushed that enhances taste and decorates grilled fish meat and seasoning sauces. Black pepper plant 10 to 20 cm high, delivered in a ball. Upon receipt of the black pepper plant, it must be replanted in a mixture of potting soil and vermiculite. Use a pot of 20 X 20 cm and think well to drain the bottom of the pot with pozzolana or rolled gravel. Once the plant of black pepper planted, water copiously during the planting then choose a rather warm and bright place. 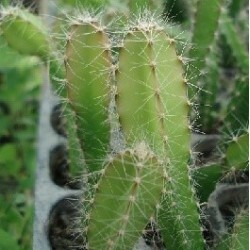 - Plant easy to grow. - Produces real black pepper.